"IT Plus Care" is the un-matched warranty provided to clients, when the vehicles are bought. As a Japan-based company, IT Plus Japan pays special interest when selecting vehicles from auctions by inspecting them physically and ensuring the superior quality. 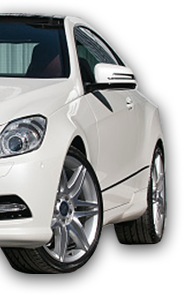 As a result, the company is confident to provide extended warranties to its' vehicles. 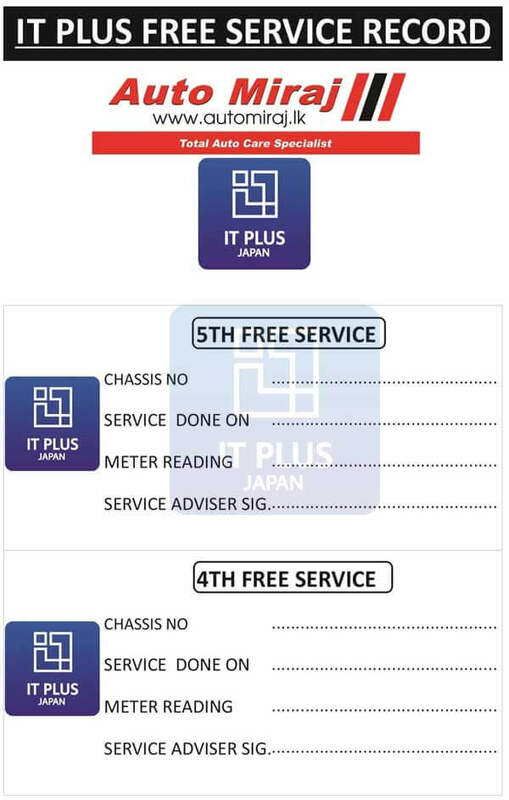 In case of a highly unlikely warranty claim, IT Plus Japan is in a position to deliver necessary spare parts etc. to clients' door-step. 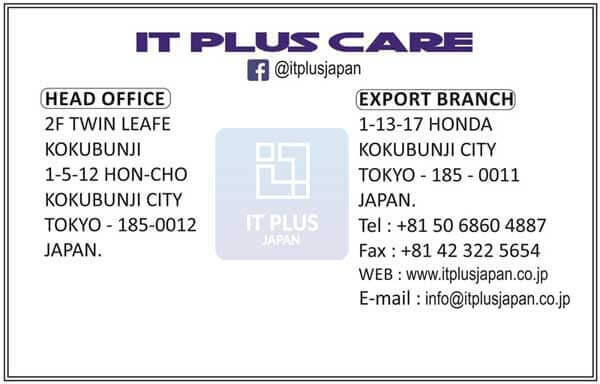 We thank you very much for purchasing this vehicle from IT Plus Japan. We hope you will enjoy driving your new car & wish you happy and trouble free driving. Brand New Vehicles - Three years or 100,000 KM whichever occurs first. Re-Conditioned Vehicles- Two years or 50,000 KM whichever occurs first. We are pleased to offer you five labour - Free Services. The Validity Period of the warranty is limited to two years or 50,000 KM for re-conditioned vehciles & three years or 100,000 KM for brand new vehicles whiever occurs first. 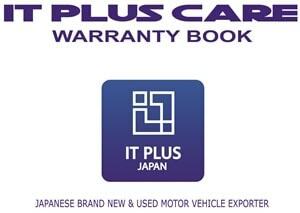 The warranty coverage is limited to repair & relpacement of parts accepted to be defective, at the sole descretion of IT plus Japan. The warranty will only cover technical defects of the Engine & Transmission,system of the vehcile. Auction Grade less than 4 and mileage more than 50,000KMS vehicles are not covered under this warranty. The warranty does not cover damages caused by accidents, improper maintenance, misuse, use of vehicle under unusual conditions, such as motor race or rallies & modifications carried out on the vehciel. The damages caused by external infulences such as chemical pollution, acid rane, sand, salt, stones and road hazards, floods, fire or disasters whether due to human fault, negligence or act of god, are not covered under the warranty. This warranty not allowed to transferring for another client. This warranty will not cover where the odameter has been interfered with,altered,disconnected or does not work. 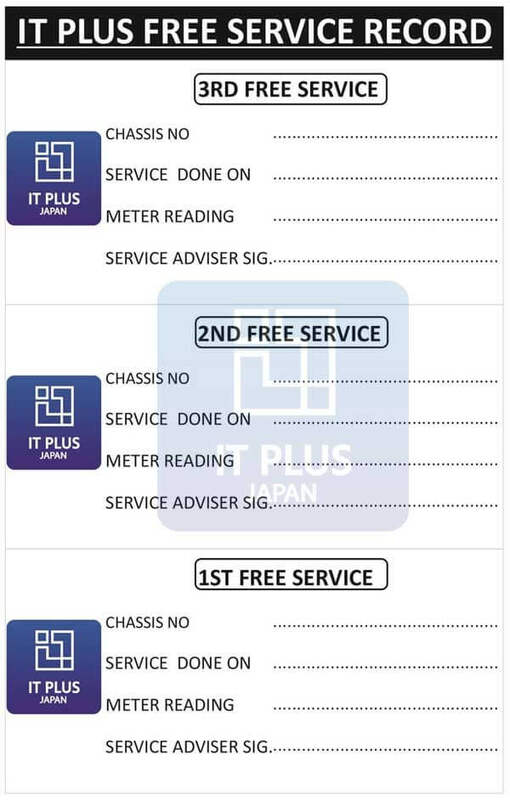 You can get your car serviced at selected Auto Miraj Service Center Islandwide. The battery should not be recharged,opened,removed,jump start or tampered and by means it should be untoched. External damages cased by accident misuse, use of vehicle under unusual condition, modifiactions to the vehicle causing the battery or the protective cover to result in leakeages or the influx of external substances will deem the warranty with immediate effect. Any issue pertaining to the hybrid battery should be immediately informed to IT plus care center in Japan. 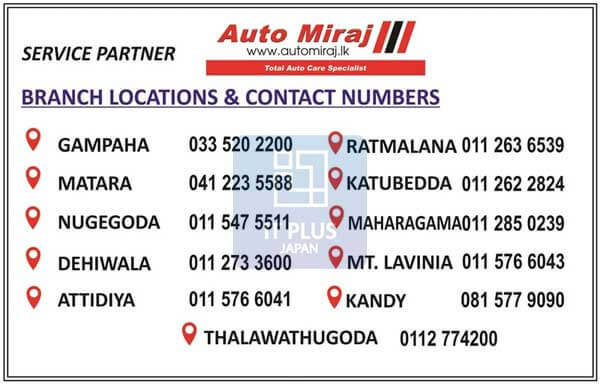 We are kindly requested to contact your nearest auto miraj service centre for all maintenance requirements & make a booking in advance.